You guys know that each month, there’s that one makeup product that grabs pretty much all my attention! 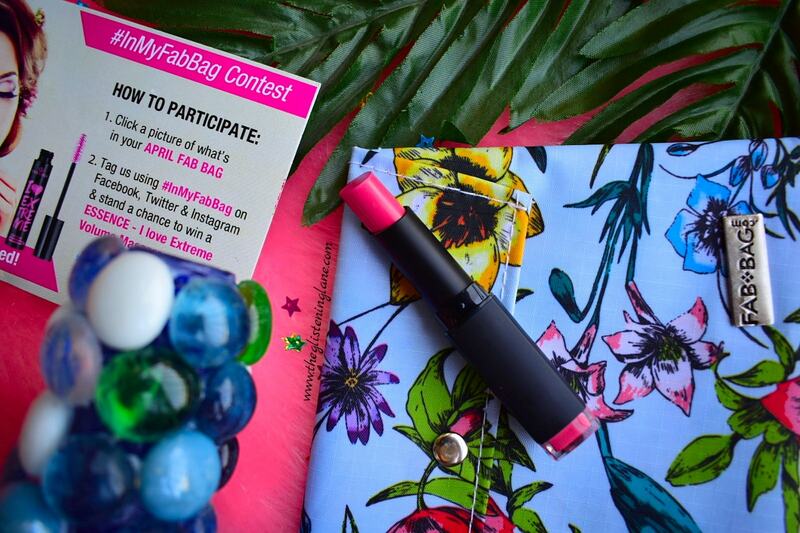 By the way, who wouldn’t love a makeup product? 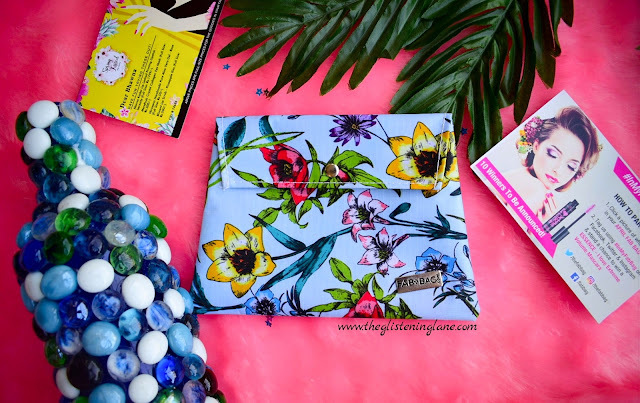 Fab bag has never failed in catering good makeup products and initially it was that sole subscription box which helped me in developing a good makeup collection. This is my first Manna Kadar products and I’ve never tried this brand before. There were two lipstick variants which were available with 3 colour shades each. Instead of the lip crayon, I decided to go ahead with the priming lipstick as I pretty much prefer long lasting lipsticks. 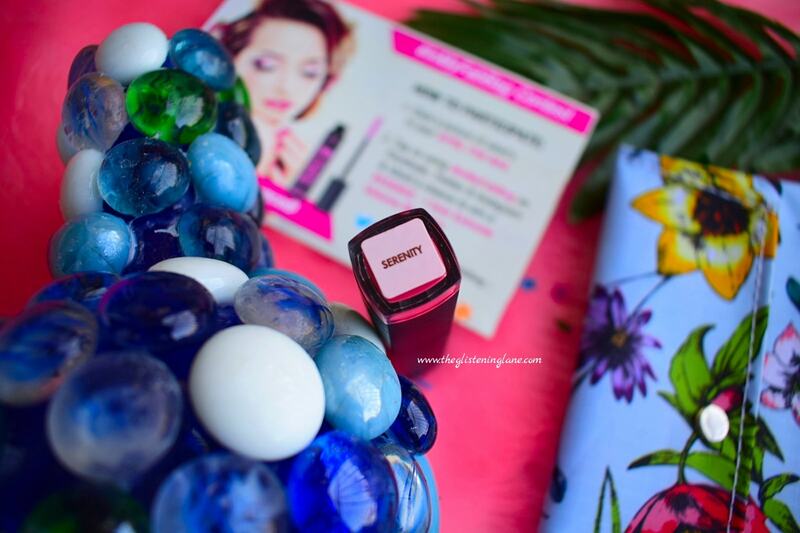 The shade that I picked is Serenity which is a beautiful everyday pink. The Manna Kadar Lip Locked Priming Lipstick glides onto the lips quite smoothly and it's somewhat semi matte in texture. 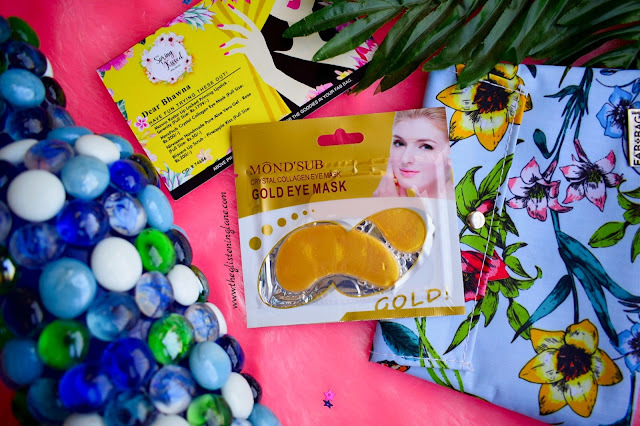 If you’ve been hooked to my blog since a year or so, you would be aware about my experience in the past with the sheets masks from the brand Mond’sub. I’ve been eyeing their under eye mask and finally I’d get to try this one out. Although, I don’t have severe under-eye circles but who doesn’t love pampering themselves, especially on those gloomy days when you want to isolate yourself from negative people or situation. 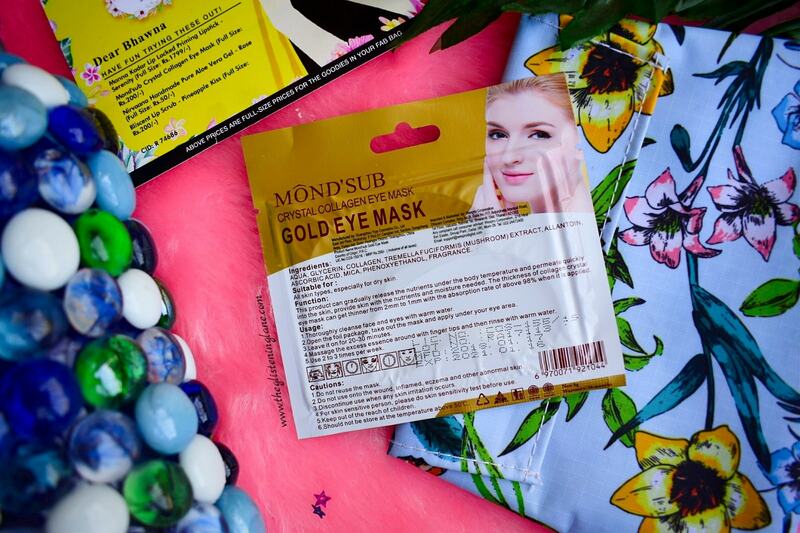 And if I haven’t mentioned this yet, I did love their gold sheet mask and this is again from the same range. Some of you might receive a lip mask which is quite innovative! P.s. do let me know in the comments down below as to what mask you received this month. Two months ago, if I’m not wrong, we did receive a charcoal soap from the brand Nirvaana. To be honest, I’ve been introduced to this brand only via Fab Bag. Aloe Vera gels are something that my oily skin never complains about. Although I had my share of bad experiences with the green variant of Patanjali Aloe Vera gel, after that I did learn what brand variants actually work for me. Bonus being, aloe vera gel are not at all greasy and thanks to its gel consistency, my skin does not sweat like crazy post application. Also, rose is an ingredient which helps in calming and soothing any inflammation or burning sensation. I’ve intentionally kept mine in the refrigerator so that it gives a cooling sensation to my skin. Lastly, it’s pretty affordable as well, which is great! 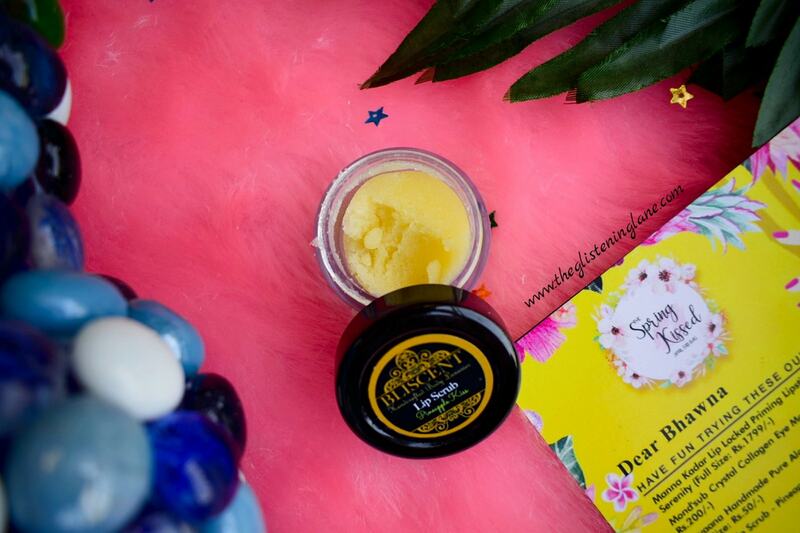 I have used a lip scrub in past and even though it can be easily re-created using products that are lying in abundance in your kitchen; I’m too lazy to make one. Bliscent is regarded as a great brand and one of my lovely co-bloggers literally suggested that she immensely loves this lip scrub and indeed it is one of the best! Also, these come in 3-4 variants and I got the pineapple one. I do love pineapples so no hardships again. 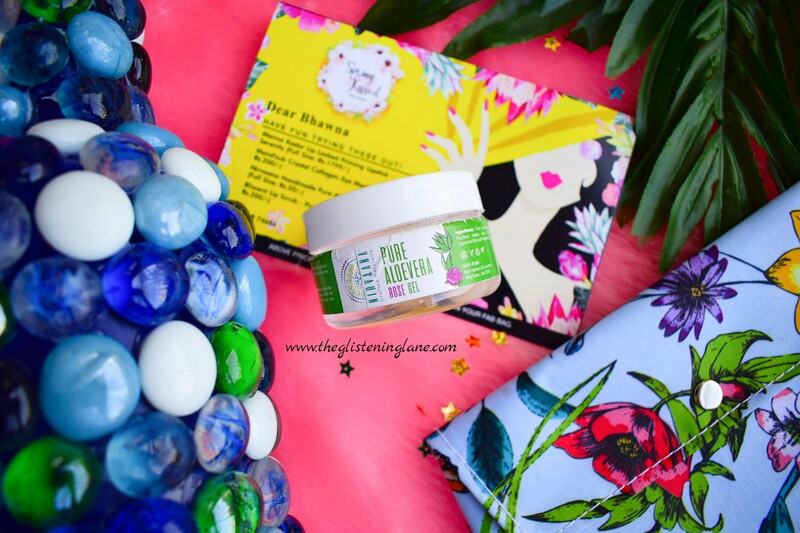 Have you tried any of the products from this brand? That’s it for today’s blog post! I find this okayish bag. 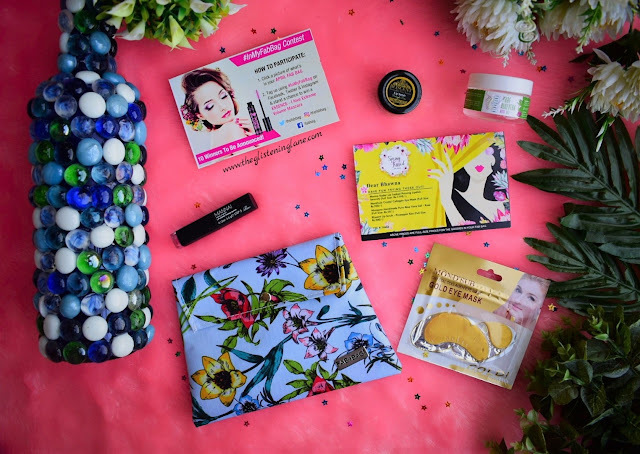 Interesting products in this month's bag. Loved the glass bottle. Did you make it? ?